Best Dr. Seuss Themed Baby Nursery Ever with Cat in the Hat, One Fish Two Fish, Horton Hears a Who and Bird from the Sleep Book. My husband and I started discussing nursery themes and eventually agreed a Dr. Seuss themed nursery. Being the planner that he is, my Hubby wanted something memorable for our baby's room and he also wanted a design that would show off his amazing artistic talents. After checking out Dr. Seuss books for inspiration and researching out the competition online, we chose our favorite Seuss storybook characters, chose a red, white and blue gender neutral nursery color palette and got started making our Baby Seuss nursery ideas a reality. To kick off our project, we tore down a few walls, moved the electrical outlets and added the finishing touch, crown molding. Before my husband started painting we made a custom built wall shelf started to shop for nursery furniture. Choosing our baby’s furniture was a toughie because we both liked the look of white furniture but my husband wanted neutral, white walls to offset the colorful decorative techniques that he envisioned in his Baby Seuss nursery ideas. With contrasts in mind, we decided that wood furniture with a dark finish would be best. It was difficult at first to find exactly what we were looking for and we bought each piece of furniture separately. Only after we had all the pieces we needed did we start to work on a layout and place them around the room. His artistic vision was to have the Dr. Seuss characters that he created "interact" with the furnishings and he did a wonderful job. Deciding on which characters we wanted for our Dr. Seuss themed nursery was tough. There were so many great books to choose from that it took quite a bit of time to narrow the selection down to our favorites. After we made our choices, my husband began laying out the placement of each character on the walls in conjunction with the location of the other nursery items. After each character's placement was agreed upon, he began the process of drawing each one on the walls including One fish, two fish, Cat in the Hat, Horton Hears a Who, the bird from "Are You My Mother? and of course, the characters from the "Sleep Book". We shopped for baby Seuss nursery stuff and coordinating decorative accessories to go along with our theme, always keeping an eye out for whimsical products with "Seuss-ish" colors and details. We found an orange table lamp and bought it because it resembles the pink clovers from Horton Hears a Who. And then we saw another lamp had red and white stripes perfectly resembling the stripes of Cat in the Hat's top hat. It was the small details that made a big impact on our Dr. Seuss themed nursery. The shape of the mobile mirrored the shape of the Sleepy storybook characters. And then we felt it was important to chose our favorite quotes so that we could have some Dr. Seuss wall quotes made; after all, he was our inspiration for the entire baby's room decor. My artistic Hubby’s talents were very helpful in choosing the text, font size, spacing and placement of the graphics. The bright fabric that we used for the window treatments helped to tie our entire Dr Seuss nursery theme together and brought fun and a much needed splash of color to an otherwise drab window. Imagine my surprise when my husband dusted off our sewing machine and made the baby’s curtains to match the Dr Seuss baby bedding and decorations in the rest of the room. I was well aware that he was talented, but I had no idea he could sew, too! I love how everything in our Dr. Seuss themed nursery is so seamlessly tied together and I hope you enjoy seeing our Dr Seuss nursery decor and think it's as cute as we do! Decorating our baby's room has truly been a labor of love and I have particularly enjoyed seeing my husband pay such close attention to the decorative details and watching his dream of creating the perfect baby room unfold before my very eyes. As we await the birth of our firstborn, I know.... WE know that our baby will be brought into a family and a nursery full of love. 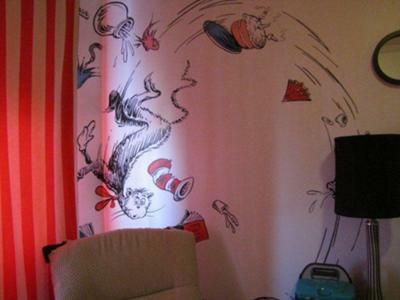 I love the Dr Seuss themed baby nursery because it is both colorful and educational. My second choice would be a world map theme but since it is not nearly as fun as this; I am definitely leaning toward a baby Seuss theme. I'm looking for some Dr Seuss posters for the nursery to frame. Does anyone know of a place where I might find some unique custom art that I can use to decorate the walls of the baby's room? Or could you perhaps recommend a DIY crafts tutorial of how I could make my own? 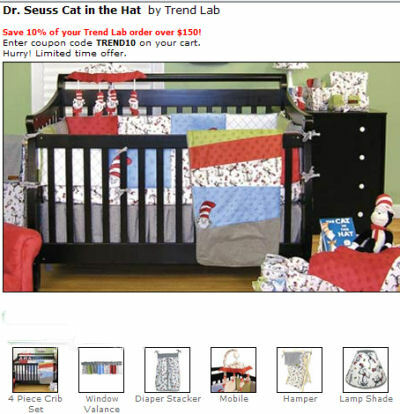 I have been looking everywhere for Cat in the Hat nursery ideas. Can your husband come and paint my nursery? If I had a baby Seuss nursery I would etch my favorite Dr. Seuss quote on a mirror... "Oh the places you will go"!